Bruce Willis returns as New York cop John McClane once again, and this time the poor guy has broken up with his wife, started drinking too much, and gotten suspended from the force. When a terrorist bomber named Simon (Jeremy Irons), who turns out to have a secret grudge against McClane, contacts him and plays a cat-and-mouse riddle game, McClane and Harlem store owner Zeus (Samuel L. Jackson) have to figure out where Simon's bombs are and where he's going to strike next. When I first saw Die Hard With a Vengeance during its theatrical release in 1995, I experienced virtually the opposite reaction that I felt when I initially viewed Die Hard 2: I really didn't like the damned thing. This third film seemed to take all the faults of the second movie and exacerbate them. Except for lead John McClane (Bruce Willis), we encountered nothing but new characters. Unfortunately, the film devoted little time for their development, and McClane's involvement with and stake in the proceedings seemed even more tenuous than during the last movie. Finally, the action sequences appeared lackluster. Upon further review, I changed my mind. While Vengeance doesn't quite approach the glorious heights of the 1988 original, it works much better than does Die Hard 2. Largely this happens because the third film doesn't really try to simultaneously emulate and distance itself from the first one. I initially saw this as a fault. Even more so than in Die Hard 2, Vengeance could feature virtually any character as the protagonist. It didn't need to be McClane, and I initially thought this semi-anonymous factor was a problem. In retrospect, however, it was probably a good thing. The whole "same thing happening to the same guy" issue damaged the second film; the similarities between the plots of Die Hard and DH2 simply made the whole enterprise much too coincidental to easily accept. 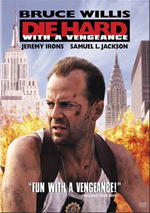 By veering off in a different direction, Vengeance better avoids that concern and it does a much more credible job of logically involving McClane in the action. The characterizations in Vengeance remain paper thin, but they nonetheless seem more rich and compelling than those in the second movie. This occurs because of the stellar lead supporting cast of Samuel L. Jackson and Jeremy Irons. While neither provides their best work, they add much needed richness to their underwritten characters. Jackson's role in particular helps distance Vengeance from its two predecessors. His character makes the movie much more of a traditional buddy picture ala Lethal Weapon in which two very different guys learn to appreciate and value each other's skills. This clearly isn't new territory, but it makes for a welcome change from the repetitiveness of the sequel's "lone warrior against the system" theme. Jackson and Willis demonstrate a terrific chemistry, and Jackson's presence largely seems to allow Willis to loosen up and provide a much more natural performance than he offered in the prior film. For his part, Jackson provides a much greater spark and depth to the role than probably should have existed; he helps the film transcend all of the buddy film clich�s in which it otherwise would wallow. Ironically, it's Irons' character who provokes the most direct comparisons to the first film. He plays Simon, the brother of Die Hard's Hans, which provides us the tenuous reason to involve McClane in the action; this scenario seems more probable than the stretches made in Die Hard 2, but not to any terrific degree. Like Jackson, Irons uses his substantial talents to flesh out his role far beyond what existed in the script. Unfortunately, he still has to live up to the memory of Alan Rickman's Hans, and Simon just doesn't get there. As good as Irons is, Simon is a fairly poorly written character, and he lacks the individuality and spark we saw in Hans. Still, Simon's much more interesting than Colonel Stuart from the second film. I've now seen Vengeance six times, and on each successive viewing, I'm more confused about why I initially disliked this film. It's really pretty exciting and fun. It easily could have poured on the bathos even more so than the second movie since part of the plot involves the potential killing of school kids, but it avoids cheap artificial emotion and simply offers a terrific action movie. At first, the near-complete removal of McClane�s wife from the plot took me aback, but I'm now very glad she's gone; the wife- saving angle clearly had worn thin, and I'm pleased we no longer have to see Willis weeping over his worries. Yes, this does make the role more generic - there's little that seems Die Hard specific here - but it really helps broaden the series. Heck, Indiana Jones and the Temple of Doom included no characters from Raiders of the Lost Ark other than Indy himself, but that factor didn't hurt the film. It may have taken me a while to get there, but I now recognize Die Hard With A Vengeance as a fine action movie and a much better successor to the first film than the quite contrived Die Hard 2. 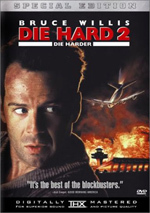 Die Hard With A Vengeance appears in an aspect ratio of 2.35:1 on this single-sided, dual-layered DVD; the image has not been enhanced for 16X9 televisions. A thoroughly dreadful transfer, the movie looked terrible. The major problem stemmed from edge enhancement. Heavy haloes marred every scene, and the film took on a very �digital� look. Jagged edges and shimmering often appeared, and most shots looked fuzzy and distorted. Some close-ups managed to seem acceptably concise, but the majority of the flick was messy and soft. The haloes turned the whole thing into a mushy disaster. Colors were decent, as the movie featured a reasonably dynamic palette. However, the messiness of the definition intruded on the hues as well and made them less impactful. The same went for blacks and shadows; they lost points because it was so tough to get past the general ugliness. A variety of specks and marks also created distractions. The transfer was enough of a complete loss to give it an �F�, but I came close and couldn�t offer anything more than a �D-�. This is one of the worst images I�ve seen from a major studio presentation. At least the sound tried to compensate via its excellent Dolby Digital 5.1 audio. As a whole, Vengeance offered a consistently fine auditory presentation. The soundfield was very well-defined and engaging. Throughout the movie, all five speakers received a nice workout. The forward spectrum provided clean and well-delineated sound that spread clearly and accurately across the front speakers. Music showed positive stereo separation, and effects were placed appropriately within the spectrum. Elements also blended together well, and they panned neatly from side to side. Surround usage seemed to be excellent, as the rear speakers often added some serious punch to the package. During quieter scenes, the surrounds stayed with general ambience, but the louder sequences strongly ratcheted up the auditory action. Those parts of the film made the rear channels active partners in the mix and they created a very encompassing and aggressive setting. When appropriate, the soundfield became quite involving and powerful. To see what I mean, check out the subway train sequence, or the climactic helicopter bit. Audio quality also seemed to be quite good. At times, some dialogue sounded slightly rough and unnatural, but as a whole, speech was fairly warm and natural. Some very slight edginess interfered on a few occasions, but those were rare, and I experienced no problems related to intelligibility. Music appeared robust and bright, and it held its own among the mix of competing elements. During DH2, I thought the score got buried beneath the effects, but the mix for Vengeance maintained a better balance, and I enjoyed the clear and vivid tones of the music. Effects were positively terrific, as they showed fine clarity and excellent dynamics. When the mix got loud, the effects appeared powerful and accurate. Low-end seemed to be very strong, as explosions and other deep elements sounded rich and vibrant. Ultimately, Vengeance offered a very fine auditory experience. Die Hard With A Vengeance skimps in regard to its supplements. It includes a short but decent Featurette. This three-minute piece stays in a promotional vein, but it includes some interesting shots from the set. 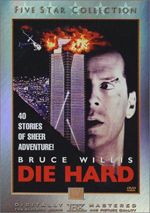 We also find theatrical trailers for all three Die Hard movies and a Slide Show that includes some publicity stills. As a film, Die Hard With A Vengeance offers a fine action experience. My early concerns with it have largely dissipated, and I now find it to be a fun and thrilling piece of work. Though it offered excellent audio, the DVD suffered from dreadful visual quality and superficial extras. I like the movie, but this is a bad DVD.